Miraculous stories of following intuition in everyday life. Sometimes the best approach to making decisions in life is to let go and let your intuition guide you. The more you “try” to control a situation or get an answer the more blocked, confused and frustrated you become. When you let go and allow yourself to be led by your gut often things just work out for the best as the following stories of intuition in everyday life illustrate. Life’s problems solves themselves if you let them. I wasn’t even supposed to be out that night but my friend called and she was upset because someone (oh, okay, my brother) had just broken up with her. She wanted to go out. She was a good friend. We went. But we only planned to go to a movie and then go home. But the movie morphed into coffee which became a drink and after that we decided to take a walk through our favourite dance club to see if anyone we knew was out. It was crowded and we were mounting the stairs from the basement pub to the dance floor level. I was in the lead and I intended to go straight, at the top of the stairs, turn left and, having skirted the dance floor on two sides, exit through the front door. But when I got to the top of the stairs I heard a voice that say, “Go this way.” Indicating a left turn. For some reason I don’t know now and didn’t know then, I listened. I turned left, and as I came around that corner I saw my future husband standing there. He saw me at that same moment. Several months ago, I was your average person struggling to make a living and dreading every day of work. My “career” was going nowhere fast. I kept getting this nagging and undeniable feeling that I was meant to do something special with my life. But, for whatever reason I kept ignoring it. Through the agony and misery, I trudged along hoping that one day it would all change. 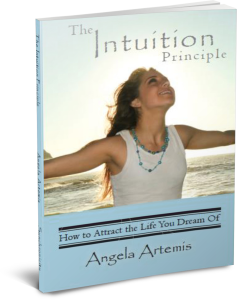 I had been reading several books including Angela’s Intuition Principle . Slowly, I began to realize that my intuition was pulling me to listen. Signs and synchronized events kept happening, and I knew it was the universe’s way of encouraging me. One day, I had this sudden urge to make a list of all the things I loved to do. It seemed ridiculous at the time, but I desperately wanted to find a career that would make me happy. I scanned down the list… writing, editing, researching, chakras, spiritual studies, dreams, etc. Instantly, I knew. I was meant to be a writer and incorporate all of these concepts into my novel. Against the advice of others, I quit my job and started working diligently on the book. I admit I even had moments of doubt as other people’s negative opinions began to haunt me. Yet, all the while, I just knew deep down that I was meant to be a writer. Six months later, I published my first book. I owe it all to following my intuition and truly listening to that gut feeling. I have struggled my whole life on what direction to take my career, but in that one moment it all became clear. Listen to your intuition, and the world will open up for you!! I have been refreshing my intuitive business lately. When I asked my intuition for guidance on how to best expand my services, the name of an acquaintance of mine popped into my head. This person runs a meta-physical store in my town. She is a gifted intuitive, who has done readings for me from many times, but I have never done any sort of business with her. I decided to contact her, even though I was a little nervous about it. When I called her, it turned out she was delighted to hear from me. It turned out she “happened to be” working on her fall workshop schedule when I called. Without even looking at my course outline, she was very happy to offer my “Contacting Spirit Guides” course to clients in her store. Not only that, she wanted my course to be part of additional workshops! 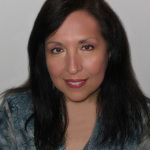 When I timidly asked her about whether she might be interested in me offering group mediumship readings – one of my recently added additions – she was very enthusiastic and encouraged me to expand to larger groups than I had even considered! Earlier this year I wrote about how I had been offered a well paying job but turned it down after accepting it in a post titled: 8 Tips to Help Get You Through a Crisis of the Soul. Essentially what happened was that after I accepted the job I became deathly ill and couldn’t get out of bed for a week! I had such anxiety about taking this job that my intuition manifested an illness to get my attention and rethink taking the job. Everything happens for a reason. For all intents and purposes the job appeared to be perfect. It was a well paying managerial job in my field (financial sales). The company was in the midst of a merger with another company which was supposed to make the job even more lucrative. I was supposed to start at the end of January and the merger was supposed to be finalized by the Spring. It is now the beginning of July and the merger is on hold. The people who were hired in anticipation of having a spectacular year are not having a spectacular year at all. They are waiting on the sidelines for this merger to take place losing income that was promised to them. As it turns out my intuition knew better and far more than I could have imagined after all. Awhile back, we noticed there was something going on with our 13 yr. old boxer, Jasmine. She was unusually restless, and I felt she was in pain. I could “see it in her eyes”. We checked her over but didn’t find anything amiss. We decided to take her to the vet. Once there, we discussed the symptoms. I told the vet I felt certain she was in pain. The vet checked her, and decided that because she had begun to drink water more often, she must have diabetes. I explained I thought the water drinking was just an anxious response to being in pain. Again, I stressed that I knew her well and was sure there was something hurting her. The vet just didn’t agree. She felt strongly that it was diabetes and that we should do blood tests. She could do some then, but Jasmine would have to fast and come back the next day for the remainder. The vet was an hour’s drive and the tests were expensive, so we asked her to give us a minute. She left the room and I had the presence of mind to go within. I “felt it out” once more. Again, I felt certain the issue was pain, not diabetes. We told her we decided not to have the tests. She warned us that Jasmine would not even last 2 more days without treatment. The next day, I found half a tooth on the floor. One of Jasmine’s, of course. Can you imagine the pain of a severely broken tooth? Over the next few days, she recovered and became her happy self again. She never did have or get diabetes. I was approached to take on a transcription contract by someone I did not know. This individual wanted me to meet at their house and told me they had some recordings they wanted me to document. I had an uneasy feeling and started to get a headache as I left my house. (Intuition sometimes works in different ways, through the body rather than a “voice”). On the drive to the place, I flipped on my car radio, and John Fogerty’s “Bad Moon Rising” came on. After I met with the client, I discovered the hours of recordings were secretly made of family members dealing with some very personal issues. This whole scenario did not feel like something I cared to be involved in, and I had never been asked to do this before. I said I needed to think about taking this on due to my “excessive workload” and returned the recordings that day by mail. What experiences of everyday intuition have you had? Did they lead you away from a difficult situation to right path in you life? Share your story with us in the comments. If you enjoyed this article share it with a friend on Facebook, Google+ or Twitter. Thanks for spreading the word. P.S. 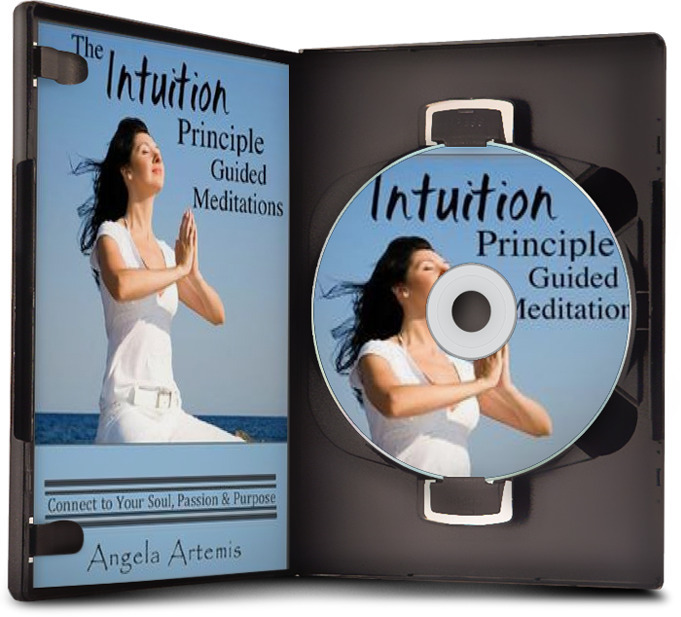 Fine tune your intuition to guide you in your life – click here! This was a fun read Angela! I can’t hear enough about following your intuition- I’m still coming to it. Sometimes the whispers are so quiet!!! As Patti says, I’ve heard stories that involved smell which pointed to an intuitive message. Just the other day my friend and I were in the stockroom in the basement and we heard what sounded like empty wine bottles fall (at least 3 of them falling against one another) upstairs. We stopped and looked at one another but there wasn’t a crash so we finished what we were doing before going to check. Then – nothing. We could not find any bottles having fallen over – anywhere in proximity! Yet we could both still hear it and described it. We heard it. We still have no idea what that could mean but it was very strange and I can’t help but feel it was a message. Very interesting about the wine bottles…..not sure what it means either. The first thought that came to mind though is “the domino effect.” When one thing happens it sets off a chain reaction. Does this fit with anything going on in your life right now? I often ask for a dream when I need more clarity. Try that? Thanks Angela! I really enjoyed reading these stories, especially Lori’s love story and Patty’s pet story. 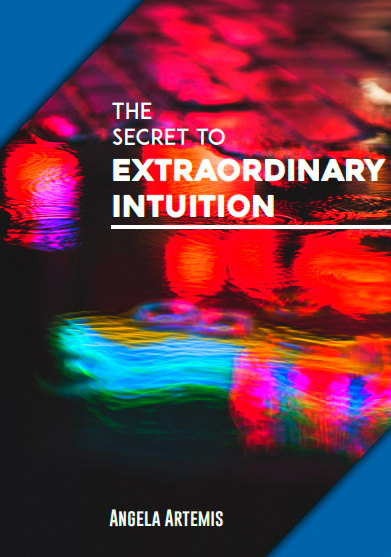 Love these ‘personal’ stories of the different ways intuition works in our world. This is a wonderful read Angela. Hi Angela, Those are such great stories! I especially like how you intuited not to take that job (much the same way I just decided to take one – all signs in favor) and Patti’s experience with the dire warning from the vet. Last year I KNEW something was stuck in my dog’s throat but it took days and multiple vet visits and finally a surgery before they found the chicken bone – and the first vet said there was nothing there. It was the size of half my palm! I’m so glad you liked the stories! You went back to work. That’s awesome. When it feels “right” and the signs are there it is so much easier to make a decision. I’m so happy for you!! You are another shining example of someone who walks the talk and teaches others how to take full advantage of their intuition. I enjoyed reading the everyday stories. You have got a nice collection of contributions, Angela. It’s great to be able to read these in a compilation. Following our intuition does help us make better decisions about work. I am more positive than ever, not to ignore the signs after reading your personal story. Thank you for sharing! I’m so happy to hear that you found this post and all the stories helpful to you. That’s what makes it all worth doing! Thanks so much for visiting and sharing your comment. I really like this post. I especially like your (Angela) and Erin’s, because I really appreciate how you both point out that intuition isn’t always “just a feeling”. It might be knocking us for a loop or banging us over the head, like literally in your cases! The real skill is in making the connection to what is going on, and realizing it’s a message. Thanks for those examples, and to everyone else too. Thanks so much for sharing your story with us here. It’s a wonderful example for readers to learn from. The message is: Trust your gut! We all second guess ourselves and you could have done just that when the vet who is the “expert” told you otherwise but you had the experience with your own intuition and confidence to believe in yourself not to allow yourself to be convinced otherwise. Yes, it is true and you make a great point: our intuition often manifests in the physical body as well. Thanks so much for pointing this out. You are such a great teacher Patti! It’s a true privilege to share your story here.